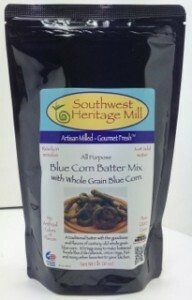 Blue Corn Batter Mix, Whole Grain & Non GMO Corn. This general purpuse batter makes wonderful chile rellenos, onion rings or batter fish, bringing the century old flavors of blue corn to a modern dish. Available with organic corn. Price increase added at checkout.